There is none so blind as those who will not see. Howard, Granny - you're wasting your breath. Explaining colour to someone blind from birth would prove a whole lot easier. Thanks Ray, but red rags and all that. My father lost a stripe for insubordination in the army and that's my starting point. even you can't defend, countries that follow this book, and implement its laws aren't distasteful? with a rising Islamic population in the UK ? how long do you think we have before, they start calling for some form of Islamic law, to be implemented into UK law?? I can just see you, Mr Weird, voting for the stoning of adulterers wives at Labour party conference? Taste doesn't really come into it, KB, but I'm not in the habit of defending regimes, whether their law be sacred or profane. As far as Islamic countries are concerned, their forms of government are a matter for their own people, and there are dissidents in all those countries working to change things, just as there are such similar deluded individuals in our own Christian paradise. As for your second question, HM1 answered it. 23-6-18 another unreported big rally outside number 10 today, and parliament? left and the right and the police in-between, for the freedom march. it amazes me that we have the street protest, and rioting all over Europe, and the big paid for media stay silent?? is this the EU superstate they keep trying to sell to us. All these protest marches, whatever the cause, prove to me is that to many people have far to much time on their hands. Hardly unreported Keith it is the lead story on the BBC, Sky and Independent websites. KB is referring to the 'UK Freedom March' which will be wending its merry way from Victoria Station to Parliament from around 1300 hours. It will end in a 'picnic of sorts'. I take this to mean that there'll be a custard pie contest with the anti-Brexit marchers and Eid celebrators in Trafalgar Square, followed by a mass unity hug-in and an orderly dispersal. Rather unwise of the police to allow two demonstrations on the same day. Doubtless the vast majority on both sides will behave perfectly well but with any large gathering thugs with their own agenda can cause major problems. 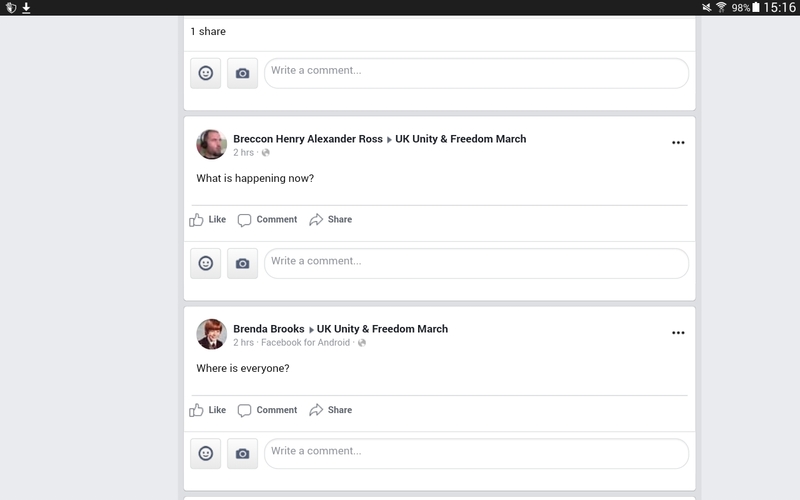 the only bit being reported is the remaining side demanding another vote, the counterdemonstration is being suppressed, you have to go facebook live streams to see them . this meeting got stopped by the police to stop the, for Britain candidate getting into the meeting . just imagine the coverage if Labour or conservative candidates had been set upon by right-wing thugs ? Just doing my bit to get the word out! Looks like they can use all the help they can get. Breitbart and UKIP daily carried an account of the hustings but the responsible press gave it a miss as it just gives the oxygen of publicity to the lunatic fringe. I doubt the For Britain candidate would have got much more than her 1. 2% share of the vote if the hustings had gone ahead. she was a candidate and entitled, by British law to have her say unimpeded. 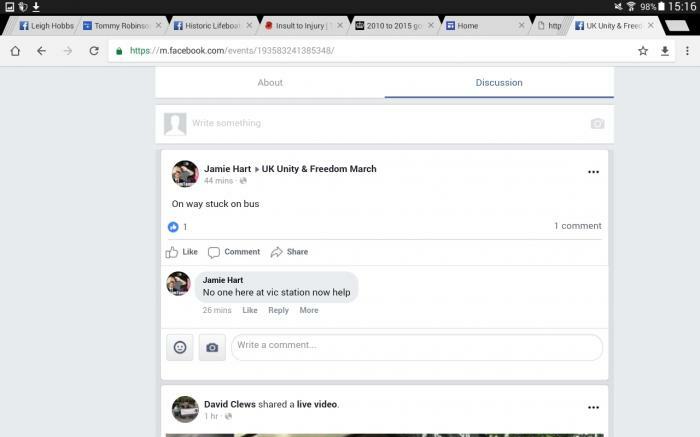 its a good job they didnt have british rail sarnies and pork pies stuffed in there donkey jacket pockets.all hell would would have been let loose. Worth noting that hundreds attending the counter protest whilst over a hundred thousand attended the main one. With this lot and others spouting I am even more certain we need to get out of Europe as soon as possible. 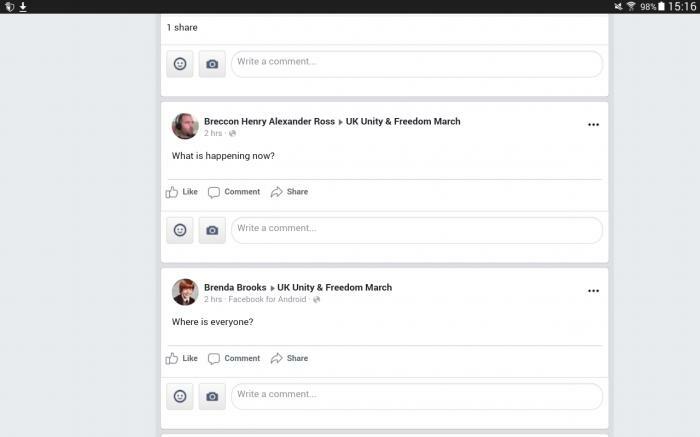 For those on the other march, speeches came from Anne Marie Waters, Gerard Batten and Janice Atkinson, no wonder Farage gives his old party and the new For Britain party a wide berth. As opposed to being governed by Duncan-Smith, Rees-Mogg and the perpetually mendacious BoJo. Give me strength. Not to mention the sainted Theresa ("a general election would not be in the best interests of the country").